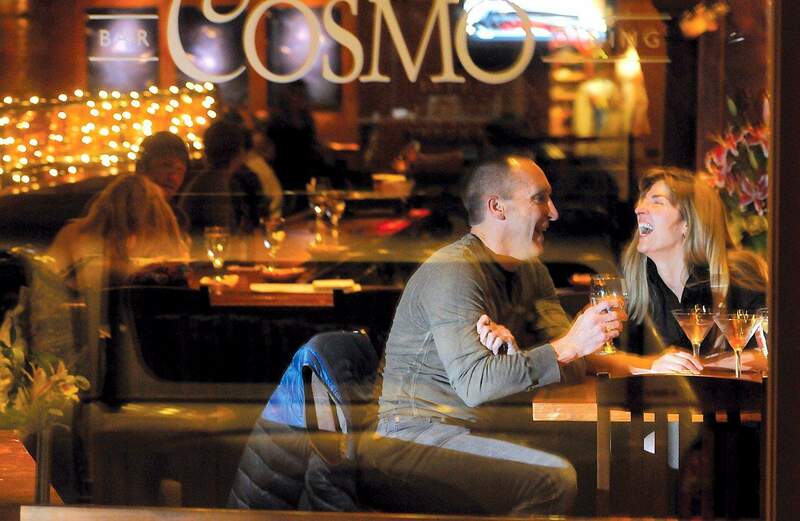 Ken Kost, left, and Rahab Villegas enjoy an evening out recently at Cosmopolitan restaurant. When Durango proved San Francisco wrong in its claim to have the most restaurants per capita, the City by the Bay changed its marketing material to say it has the most restaurants per capita of a major city. By one count, Durango has one restaurant for every 120.6 residents compared with San Franciscos one restaurant per 227 residents. But to the great chagrin of San Francisco  and to the great embarrassment of the Gray Lady  in fact, Durango has more restaurants per capita than its coastal foe. According to the San Juan Basin Health Department, there are 357 food service establishments in La Plata County  or one eatery per every 143.7 of its 51,334 residents. But using countywide data actually understates the number of restaurants per capita in Durango. Mike Meschke, the local health departments director of environmental health, said there were fewer than two-dozen restaurants outside Durango city limits  which means that there is one food establishment per every 51 of Durangos 16,887 inhabitants. But Meshcke warned that food establishments include grocery stores, convenience stores, schools and restaurants. Meschke said there were about 140 full-service, fast-food, short-order and complex-menu restaurants in Durango. Even when using this more conservative figure, there turns out to be one restaurant per every 120.6 Durangoans, a ratio that puts San Franciscos one for every 227 residents to unambiguous shame. On the Durango Area Tourism Offices website, this fact is trumpeted with understandable heraldry. Laurie Armstrong, director of media relations for the San Francisco Travel Association, remembers the story differently. Its funny  for years and years, we claimed that we had more restaurants per capita than any other city in the United States. Then a few years ago, I got one phone call  I believe from someone in the Durango Tourist Bureau  wanting to do their due diligence, said Armstrong. 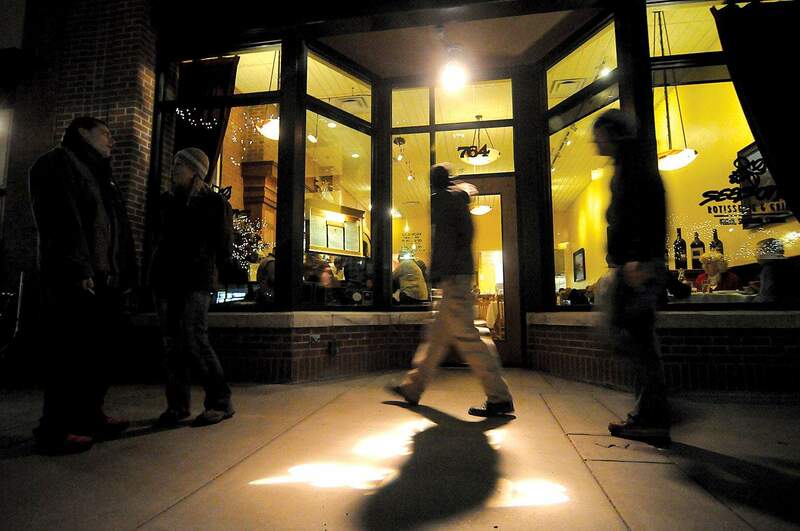 We did the math, and it turned out that Durango really did have more restaurants than we do. So we had to change our materials to say that we had the most restaurants per capita of any major city, she said. Over the last five years, dozens of towns have claimed (often spuriously) to have more restaurants than San Francisco  including Dallas; Wichita, Kan.; Madison, Wis.; Washington, D.C.; Shreveport, La; Lafayette, La. ; New Orleans; Myrtle Beach, S.C.,; Fairfield, Iowa; Portland, Ore.; Portland, Maine; and Louisville, Ky.
In San Francisco, were famous not just for the quantity of our restaurants but their quality. When we see lists of the best dining cities in world, were up there with Paris and Tokyo, she said. To chefs and restaurateurs, being awarded a Michelin star  the first and last word in culinary excellence  is the gastronomic equivalent of winning a Nobel Prize. No restaurants in Durango, Colorado, or indeed the Southwest, are currently Michelin starred. San Francisco, by comparison, has 47 Michelin-starred restaurants, the most per capita of any American city, and the 12th most worldwide. Kyoto, Japan, with a population just shy of 1.5 million, has 136 Michelin-starred restaurants, making it the leader in Michelin-recognized restaurants per capita. But Pete Meersman, president of the Colorado Restaurant Association, disputes that Durango lacks world-class restaurants. You live in my favorite place in Colorado  its a great restaurant town regardless, he said. Meersman would not name his favorite Durango restaurant on the record, citing Switzerland as the example of neutrality that his job obliged him to emulate. Karen Barger, owner of Seasons Rotisserie & Grill on Main Avenue, agreed that Durango is an internationally respected culinary Arcadia. Weve had customers from China, Germany, France, Italy, Lebanon. While I prefer to live in a town like Durango over San Francisco, our restaurant could stand up in San Francisco, as could a number of restaurants in Durango, Barger said. For the size of our town, we have amazing, amazing choices for an amazing range of food, said Barger. In December, Smart Money magazine even featured Durango in an article titled Retire Here, Not There: Colorado, which named four less-known havens for living the Rocky Mountain high life. It cited Durango as a destination for the small-town foodie and noted Oprahs former personal chef opened a restaurant here called The Palace. Cohen said bragging that Durango has more restaurants per capita than San Francisco is central to Durangos cultural cachet.